Like people of all regions and religions, a large number of Hindus have been migrating to all the parts of World. The reason behind this is better pastures and better living standards in those places. In most of the parts of the World one can see a substantial number of Hindus/people of Indian origin. The concentration of these émigrés is particularly more in richer countries. Earlier large number of Indians migrated to UK, Canada and currently United States is the hot favorite. The émigrés from here do tend to adapt to the countries they adopt, still retaining their umbilical cords. Some of them locally meet to celebrate their Indian-ness; some also meet bearing their religious identity as Hindus or Muslims in particular. There is a large Diaspora, from India scattered all over the US. 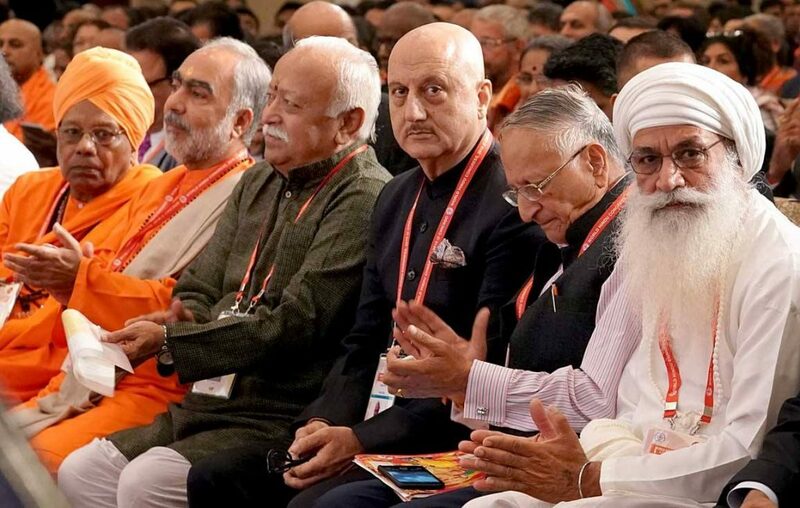 Some Hindus among them recently held World Hindu Congress in Chicago and invited RSS chief Mohan Bhagwat to address the same. Interestingly at the site of the WHC there were posters which showed RSS agenda in a blunt way. One such poster related to Love Jihad, depicted the marriage of Shramila Tagore to Mansoor Ali Pautadi as love jihad. Posters question whether Saif Ali Khan will force his wife to Kareena Kapoor to convert to Islam and also as to why they gave an Arabic name to their son (Taimur). In loud and clear manner the posters say that interfaith marriages are a silent Holocaust of Hindus, showing a clear patriarchal mindset of the organizers. These assertions of WHC council did not go unchallenged from the progressive Indians community. Many from Indian origin community stood to challenge with a statement and labeled RSS politics as “Hindu supremacist ideology that is spearheading the violation of human rights and religious freedom of minorities in India.” Many young activists from Chicago’s ‘South Asians for Justice’ shouted slogans “RSS Turn Around, We don’t want you in Our Town,” and “Stop Hindu Fascism.” These protestors had some fracas with those attending the conference.